The Syrian Curled Dewlap – also known by the names: Frisé Syrien, Syrische Gelockte Wammentaube, Messagero Arricciato Siriano, Papada Rizada de Siria, Сирийский Пузатый Голубь (Карликовый) – is a varietal originating from Syria (northern part), and Asia Minor, but no information has been found since when it was developed (estimated only in the 20th century). 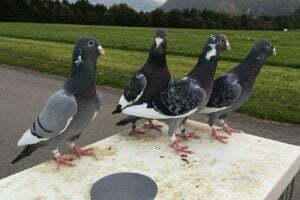 The varieties grouped into this type of Utility form pigeons are still close relatives of the “dewlap” varieties (Adana, Basra, Mawardi, Abu Abse, and others – all of which are Syrian varieties). Some records indicate that the development of these varieties early and intensively was done in Francis (so EE establishes Francis as the country of origin). 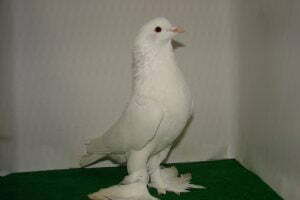 This variety has good flying ability, but it seems that now the aspect of appearance is more of a focus of development.